My sister is pregnant and oh, so particular about what she eats. Use celery salt, and her gag reflex gets jittery. Deviate from the gumbo recipe a fraction, and well, it’s not you, it’s her taste buds. ( Never mind the 30 minutes you spent nursing the roux.) But nail the cranberry white chocolate scone recipe, and it’s like watching someone win the Publisher Clearing House Sweepstakes. It’s just that much fun to watch her eat something she enjoys. I guess that’s why I bother to continue to endure the grueling task of feeding her finicky cravings—that and I love her. Cindy is also a fan of crime dramas, True Television and Nancy Grace. She and my mother watch an unhealthy diet of these shows. Much to my amusement they have selected which psychic detective they would use in the tragic chance a family member or they themselves disappeared. To which I answered, “How many psychic detectives are there?” Apparently, plenty and I laughed to further discover that my mother was “uneasy about life insurance policies” for her daughters. This conversation about sleuthing for missing persons came to mind when my sister gave me the news on Friday that my contribution to Sunday dinner would be Grandma Sewell’s Banana Pudding. “Got that psychic detective handy because I have never made this recipe, nor has anyone written it down.” It was an impossible assignment—not one a non-pregnant Cindy would have handed out so casually, but I took it like a woman and embraced the challenge. Now, my grandmother is still alive at 87 years old. She is practically deaf, blind in one eye, but very much with it. However, Grandma Sewell cooks without measurements and cannot verbalize the tricks to getting biscuits to rise or why her meringue leaps up at the sky. She’s been making these recipes for seventy years and its part of her. Asking would make her feel bad because she wouldn’t know how to explain something so simple and putting her into that position would be impolite and downright un-southern. Once I agreed to the monumental task, I decided to take the approach of a CSI: Cooking Scene Investigation detective. First order of business was to interview the witnesses. I called the usual suspects, both of my sisters and a cousin to see what they remembered about the taste of the dish. Next, I turned to my mother for historical perspective and a few hard facts. I ran a few recipes by her. “No” my mother said, “Grandma serves her pudding warm, not cold.” Yes… I remembered that, it was hot but isn’t pudding thick BECAUSE it goes into the refrigerator? Hot/cold…what? How could it be confusing to replicate a dish I had eaten my whole life? This crucial reminder got at the heart of the mystery and narrowed the search for the final recipe. I eliminated all cold preparation recipes from the pool. Naturally, I decided to turn to another Southern cook, Paula Dean, but her recipe called for cold storage and whipped topping. Next, I scoured the reference for cooking, my beat up stained copy of the “Joy of Cooking.” This recipe offered optional whipped topping or meringue, but it was thickened with cornstarch. Grandma did not come from cornstarch stock. We were buttermilk biscuit, sausage-gravy-eating-flour people. That I knew for sure. Out of desperation, I looked at the vanilla wafer box recipe and cringed when I saw instant pudding—maybe in polite company that would fly, but my pregnant sister wouldn’t stand for it. Finally, I went online and started to Google my way through the various recipes eliminating cold recipes, all cornstarch and anything else that felt European or called for a Yankee pudding pot. At last, my sleuthing paid off and I stumbled upon a respectable Banana Pudding Recipe. I tackled the recipe and it was a little more difficult than I anticipated, but the stakes were high and Sunday dinner was but hours away—which left little room for error. I hesitated to turn the burner too high for fear of scorching the milk, but was forced to go to medium to get it to boil and thicken. Then the meringue got a little tempermental because it was a humid day—but adding more sugar made it peak and eventually lick at the ceiling. Shew. It looked right, but I forgot to add wafers to the top for garnish…oops. I packaged the pudding into my carrier and nervously took it to my sister’s house. Was this indeed the right recipe? Did it explain the unexplainable? Did it provide a logical step-by-step account of my grandmother’s actions? Did it hold up in Cindy’s court of temperamental tastes? Yes, the recipe was a hit. Thanks to my CSI: cooking scene investigation tactics, it is now safely returned to the family and it didn’t take a psychic to do it. Ask other people what they remember about the look and taste of the dish—even better did they ever see the recipe being made? Write notes and save for search. Can you identify an era, region or ethnic origin of the dish? Utilize this information to begin searching cookbooks and online. 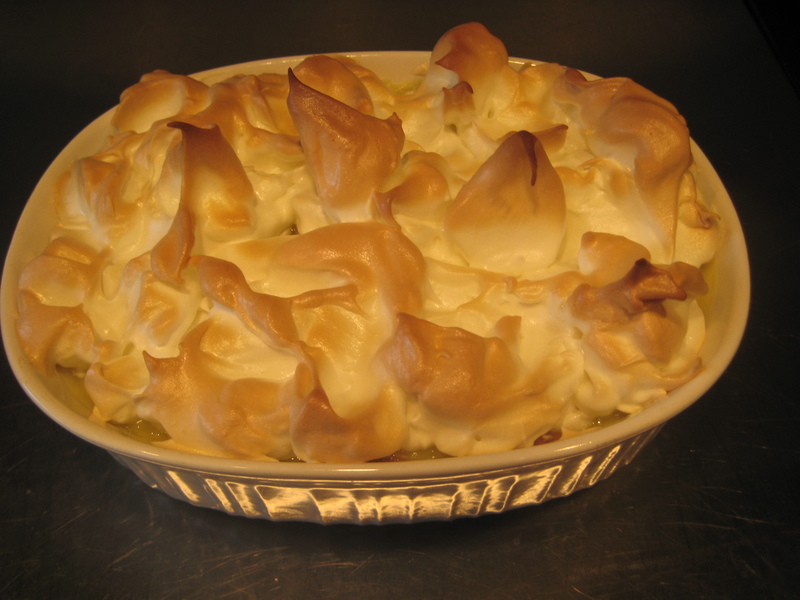 Search online by using ingredients as key words: “banana pudding ‘meringue’ recipe” or “old-fashioned banana pudding” or regionally “southern banana pudding recipe.” I often search for recipes by ingredients and it helps narrow the options quickly. Try to ‘cook’ with the same utensils. My grandmother never owned a double boiler or a non-stick pan. She used a wooden spoon and a round deep cookware dish she got at a tag sale. Keep trying recipes until you get it right and then write down and distribute to rest of family. Line the bottom and sides of a 1.5 quart baking dish with a layer of alternating vanilla wafers and banana slices. To Make Pudding: In a medium saucepan, combine 1 1/2 cups sugar with flour. Mix well, then stir in half the milk. Beat egg yolks and whisk into sugar mixture. Add remaining milk and butter or margarine. Place mixture over low heat and cook until thickened, stirring frequently(may have to bump up the heat, but keep stirring and watch it like a hawk.) Remove from heat and stir in vanilla extract. Pour half of pudding over vanilla wafer and banana layer while still hot. Make another layer of alternating vanilla wafers and banana slices on top of pudding layer. Pour remaining pudding over second wafer and banana layer. To Make Meringue: Allow eggs to come to room temperature (30 min. )In a large glass or metal bowl, beat egg whites until foamy. Make sure eggs are foamy before adding sugar. Gradually add 1/4 cup sugar, continuing to beat until whites are stiff. If they don’t stiffen continue adding sugar—up to 1/4 cup per egg white. Spread meringue over last layer, making sure to completely cover pudding layer. Bake in preheated oven for 15 minutes, just until meringue is browned.